Words are spe­cial things to me, and when I was a small­er geek and would try to fig­ure out the mean­ing of unknown words, I would often form a men­tal image of a word’s mean­ing based on, often times, anoth­er word it sound­ed like (regard­less of whether the two words actu­al­ly had any­thing to do with each oth­er). Some­times, I’d actu­al­ly use con­text to help deci­pher the mean­ing of the mys­tery word, but that wouldn’t always lead me to the right answer. From time to time, I’d be unable to shed this first impres­sion of a word, which would stick with me even after I would learn the word’s actu­al mean­ing. I’d have these false images some­times pop into my mind when I’d hear the word itself used else­where, even know­ing full well what it real­ly means. So when I found myself, in more recent years, find­ing the word calami­ty to be, of all things, bizarrely amus­ing, I began to seri­ous­ly ques­tion how this could be. It’s not like I find calami­ties them­selves fun­ny. And the word is not one I hear used much on a day‐to‐day basis, and it cer­tain­ly isn’t one used to describe things that are sup­posed to be fun­ny. It’s not near­ly as well‐used as its syn­onyms cat­a­stro­phe, dis­as­ter, or even tragedy. So why would I find it dif­fi­cult to sup­press a smirk when hear­ing or read­ing about some­thing that some­one described as calami­tous? Here’s what tru­ly brought my strange rela­tion­ship with the word to a head: I used to work for a com­pa­ny with pret­ty strong ties to the Philip­pines, so when the rather dead­ly Typhoon Ondoy (a.k.a. Ket­sana) rolled through the coun­try dur­ing my time employed there, the storm, and its effects, were more than just the head­line or two that they may have been to most Amer­i­cans. Read­ing pret­ty exten­sive­ly about the storm, both through news reports and first­hand accounts from many of our cus­tomers, I noticed, a hand­ful of times, many pinoys using calami­ty to describe what had hap­pened there. To what we owe their word choice is not some­thing I under­stand or am real­ly con­cerned with, actu­al­ly. More impor­tant was the invol­un­tary smirk­ing effect the word had on me. That I could find myself amused by some­thing so strange, in the face of tales and pho­tos of death and destruc­tion, was some­thing I found unset­tling, so I lat­er thought hard about where this feel­ing like­ly came from. I can’t quite remem­ber how I made the con­nec­tion, but it even­tu­al­ly hit me. 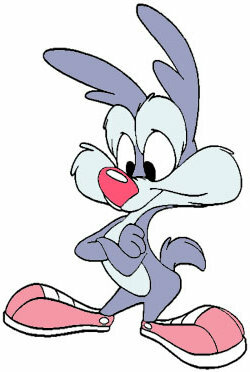 That cute lit­tle guy to the right is Calami­ty Coy­ote, a char­ac­ter from the early‐90s ani­mat­ed tele­vi­sion series Tiny Toon Adven­tures, a show that may not have made as last­ing an impres­sion on me as oth­ers from the era did, but is one I def­i­nite­ly remem­ber watch­ing. (I remem­ber the theme song very well, for what that’s worth.) Calami­ty is also a rel­a­tive of Wile E. Coy­ote, or some­thing. Lack­ing any oth­er con­text to explain to my single‐digit‐aged self the mean­ing of the word calami­ty, I must have assumed that it meant… well, some­thing fun­ny! Because, you know, the show was made up of fun­ny char­ac­ters doing fun­ny things, so this unknown word must mean some­thing fun­ny. It makes per­fect sense to me, and feels like the expla­na­tion, the true cre­ation myth I’ve been look­ing for. I can’t imag­ine where else a younger Everett would have come across that word, and it’s not one I’ve seen enough times in the inter­ven­ing years, mak­ing this one of those wrong def­i­n­i­tions I still just can’t for­get.